Other Ingredients: Dibasic Calcium Phosphate, Sodium Starch Glycolate, Magnesium Stearate. No Artificial Colors. No Artificial Flavors. No Preservatives. Keep Out Of Reach Of Children. Do Not Use If Imprinted Seal Under Cap Is Broken Or Missing. Warnings: Do Not Use This Product Unless Advised By A Physician If You Are Pregnant, Attempting To Become Pregnant, Or Nursing; Or If You Are Taking Any Medications Or Have Any Chronic Disease, Including Hypertension (high Blood Pressure), Diabetes, Or An Endocrine, Auto-immune, Depressive, Bleeding Or Seizure Disorder. 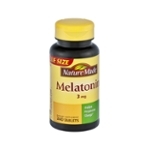 Do Not Take Melatonin While Operating A Motor Vehicle Or Machinery. Not Intended For Individuals Under The Age Of 18. ?? ?these Statements Have Not Been Evaluated By The Food And Drug Administration. This Product Is Not Intended To Diagnose, Treat, Cure Or Prevent Any Disease.